The post The Single Mom’s Guide to Working from Home appeared first on Work from Home Happiness. Single moms have a lot on their plates. They’re breadwinners. Parents. Caregivers. Cooks. Disciplinarians. Teachers. Confidants. And so many more things to their children. This also makes many single moms (and dads) some of the hardest workers out there — both a blessing and a curse. The curse comes in when working to make ends meet comes at the cost of missed family time. Long days in the office = less time at home. And that arrangement doesn’t always make sense for the single mother. The average cost of childcare for non-school age kids is $11,666 a year — enough reason for many to find an alternative to a standard office job. How do I know, you ask? Well, you see, I am a single mother! It’s not something I frequently broadcast or discuss — not for being ashamed but because it doesn’t define me as a person or blogger. But recently, I’ve been getting a ton of emails from single mothers, like myself, who are desperate to earn a living from home so they can take care of their little ones, in every sense of the phrase. And that’s where the inspiration for this post came from. So, if you’re a single parent and want to work from home or are curious about how it’s humanly possible to watch children all day, manage a household and make ends meet as a one-woman show — read on. I’m sharing some not-so-secret secrets with you today. It’s one thing to say you want to work from home. It’s another to actually do something about it. The first important to step to take after you decide you want to make this work from home, stay at home, single mom thing work is to define your goals! For me, my goal was to stay home with my infant son as long as possible. After he was diagnosed with autism, my goal evolved to include being ever present to provide the support he needed — doctors visits, therapy and hands-on care. Your goals may be similar — or on the complete opposite end of the spectrum! Help with special needs and disabilities? Be readily available for your kids? Supplement income received from child support? 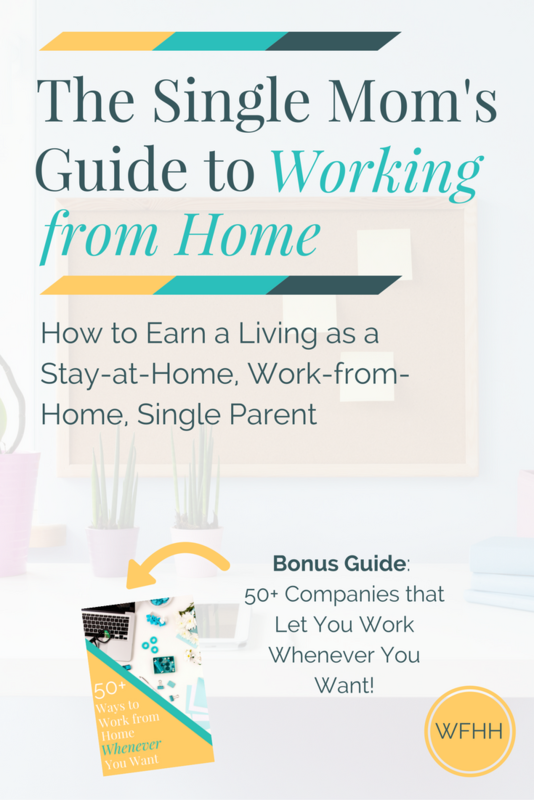 Defining your work from home goals as a single parent will give you something to shoot for as you wade through the sometimes murky work-from-home waters. As a single mom, you’re probably great at a lot of things — improvising meals, settling sibling disputes, maintaining peace, and restoring order are all things that come to mind. And while these are great parenting skills to have, you’ll also want to identify the hard and soft skills in your repertoire that make you an equally awesome job candidate. As a reminder, hard skills are those that are learned like mathematics, finance, and programming. Hard skills are easy to measure — you can take tests and other assessments to prove your knowledge. Soft skills are not as easily measured and include things like networking, self management, and organization. Taking an honest assessment of your skills will help you narrow down your job search and keep you from wasting valuable time on gigs that aren’t the right fit. Terrible typist? You’ll want to rule out transcription work. Grammar goddess? Perhaps writing, editing or proofreading are more your speed. So, before you start applying, assess your skills first so you can find the right gig that puts your existing skills to work. With your goals in mind and skills assessed, you’re probably ready to start applying. But, not so fast. It’s important to head into the job search with your expectations in check. And I say this, not to discourage you but to help you remain realistic about the entire process. As I said before, it’s easy to say you want to work from home. It’s a much different ballgame to actually secure work as a (single parent) telecommuter. As a single parent, you probably have limited time during the day. This is especially true if you have an infant or non-school-aged kids in your care. What’s your availability like? You may have daytime hours available or you may only be able to work nights. If you’re a new mother, squeezing in work during naptimes is a likely scenario you’ll face. It’s tough. I know. But it’s totally manageable. You need to honestly look at the time you have available and commit to finding work that fits into your busy life — not the other way around. In any household with children, chaos at some point in time is pretty much a guarantee. If your life as a single parent is anything like mine, chaos is an everyday occurrence. Really, I wouldn’t have it any other way. But when it comes to working, chaos can be defeating. Keep in mind, some of the most readily available work from home jobs are in customer service. And, nine times out of ten, these positions require dead silence, private workspace, and the ability to be tethered to your desk during your shift. I’m going to bet, for most single moms, this is next to impossible — so before looking for work, know that, life in general, may limit your ability to work a number of popular at-home jobs. You know you’re going to have limitations when it comes to working from home as a single parent. And that’s okay if you remain open minded about remote working possibilities. Don’t rule out anything just because you’re not familiar with it or could never have imagined yourself as (fill in the blank here). The truth is, you may very well land on something that works perfectly into your busy schedule even though it’s something you would never have considered. If you made it this far, you’re probably pretty eager to start your job search. The best place to start depends on your goals, skills, and work-from-home restraints. That’s why I asked you to figure out those things out beforehand. So, keeping those things in mind, let’s look at the types of at-home jobs. When you work from home as an employee, there are benefits you’ll likely receive. This may include paid time off, health insurance, 401k, and other job-related perks. As an employee, you’ll also have taxes taken out of your check for you. And if you’re laid off or injured, you may be eligible for unemployment or workers’ compensation. While employee jobs come with some pretty great perks and stability, they’re often the least flexible. You may be required to stick to a rigid schedule, maintain a proper home office, and provide a distraction-free, noise-free environment to do your work — not always possible as a single mom. As an independent contractor (IC), you have greater control over how you work and when than you do as an employee. When my son was born, I was already working from home. But I soon found, with an infant in my care, I needed something that offered a little stability with a ton of flexibility. That’s when I opted to become a legal transcriptionist. This worked out great. I was assigned work twice a week with specified due dates. As an IC, it didn’t matter when I worked as long as I turned my assignments in on time. When you work as an independent contractor, you are not eligible for employee benefits and you are responsible for your own taxes. There is no guarantee of work and your contract could end at any time with or without warning. While the possibility of losing income, having to pay your own taxes, and securing health insurance can be a little scary, being an IC comes with a lot of flexibility for single moms who can’t stick to a set schedule. Plus, there are plenty of opportunities to work from home as an IC and, with it, the chance to work when you have free moments. I know it’s not ideal — when my son was an infant, I worked tirelessly while he napped and often kept odd hours just to get work done. But it paid off — we never went without and as he got older, I was able to explore different options. The difference between freelancing and working as an IC boils down to how you get work. When you’re an IC, the work comes to you via the company you contract with. As a freelancer, you’re entirely in charge of securing work. But it’s not as daunting as it sounds. With marketplace sites like Upwork and good ol’ fashion cold emailing, you really can get a good roster of clients built up. And what’s great about freelancing, my preferred method of working as a single mom, is that your career is completely in your hands. From what you charge to who you work with and when, you get a say in it all — and that to me cannot compare to any other way of working. There are so many ways to get started as a freelancer — and, really, you can sell just about any freelance service you can think of from the obscure to the in-demand. Whatever it is you’re good at — writing, bookkeeping, proofreading, typing, assisting — you can freelance it. There are no shortages of ways for single moms to become online entrepreneurs. Of the at-home options, this is probably the most flexible and has the possibility of earning really well. However, it will take some time to start seeing real money com in — you may even need to take a course to help guide you from single mom to online mompreneur. So, if you have the time and resources out the gate — great! You can dive right in. If not, you may want to consider this a side hustle before you go all in. That’s exactly what I did. I was working as a freelance writer and also doing some transcription work and even a little virtual assisting, but on the side, I was building this blog. If this sounds like something you’d like to pursue — now is a good time to get into the online entrepreneur landscape. And you can turn whatever it is you’re passionate about into a legitimate revenue stream — write an ebook, become a blogger, sell on Etsy, flip thrift store finds for profit — you can earn well when you put your passions to work or sell your knowledge online. You know your goals, assessed your skills, are receptive to all remote jobs and have a handle on the ways to earn. Great! So how exactly do you piece that all together into a legitimate income? That’s up to you! If you have enough time during the day to secure full-time employment with benefits — go for it! For flexibility seekers, freelancing may be your thing. And if you’ve got an untamable mompreneur spirit, starting an online business may be your best bet. And know this: It may not be easy — from the job search to actually managing life as a stay-at-home, work-at-home, single mother, things can get rough. But the good often outweighs the bad and, if you’re determined, you can make this work and gain valuable family time while still earning a living. If you’re open to the idea of piecing together a living online, sign up below to receive my guide of 50+ ways to work whenever you want. These gigs may not all offer full-time income but when put together, can make ends meet week after week! And last but not least, I’m here to help. I was once in the same spot you are (and still am!). If you have a question, need to chat, or are at a loss of what to do — please, feel free to email me: ashlee@workfromhomehappienss.com You can also keep in touch on Twitter where I’m known to hang out under the handle @AshleeWrites.